Research published in 2001 showed that fluoride (F) deposits in the pineal gland with age and is associated with enhanced gland calcification. "There was a positive correlation between pineal F and pineal Ca (r = 0.73, p<0.02) but no correlation between pineal F and bone F. By old age, the pineal gland has readily accumulated F and its F/Ca ratio is higher than bone." "The role of the nonvisual photoreception is to synchronize periodic functions of living organisms to the environmental light periods in order to help survival of various species in different biotopes." The pineal gland is best known for its role in producing the hormone melatonin from serotonin (triggered by the absence of light) and affects wake/sleep patterns and seasonal/circadian rhythms. 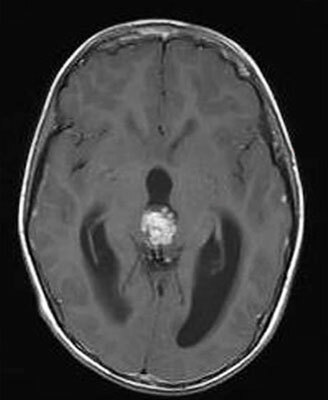 Like a tiny pea-sized pine cone it is located near the center of the brain, between the two hemispheres and is a unique brain structure insofar as it is not protected by the blood-brain-barrier. This may also explain why it is uniquely sensitive to calcification via fluoride exposure. Technically the mammalian pineal gland is neural tissue, and the cells within the pineal gland - the pinealocytes - have characteristics that resemble the photoreceptor cells in the retina. "In our opinion, the main trend of today's literature on pineal functions--only considering the organ as a common endocrine gland - deviates from this structural and histochemical basis." The pineal gland has been a subject of much interest since ancient times. Galen described it in the 3rd century, and the philosopher René Decartes (1596-1650) identified the pineal gland as the "seat of the soul." "My view is that this gland is the principal seat of the soul, and the place in which all our thoughts are formed. The reason I believe this is that I cannot find any part of the brain, except this, which is not double. Now it is impossible to find any such place in the whole head except this gland; moreover it is situated in the most suitable possible place for this purpose, in the middle of all the concavities; and it is supported and surrounded by the little branches of the carotid arteries which bring the spirits into the brain." Decartes was one of the few philosophers who was experienced in vivisection and anatomy, and who rightly pointed out the unique nature of the pineal gland's location in the brain and blood supply. Pineal gland calcifications upon dissection resemble gravel, and are composed of calcite (calcium carbonate) and/or calcium hydroxylapatite, the latter of which is not unlike dentin or bone. Prozac may represent an archetypal example of how fluoride affects the personality/soul. This drug (chemical name fluoxetine) is approximately 30% fluoride by weight and marketed as an "antidepressant," even while a major side effect of its use and/or withdrawal is suicidal depression. Modern psychiatry often treats depressive disorders - the "dark night of the soul" - as an organic disorder of the brain, targeting serotonin reuptake by any chemical means necessary. Fluoride and fluoxetine, in fact, may accomplish their intended "therapeutic effects" by poisoning the pineal gland. Animal studies confirm that when mice have their pineal glands removed they no longer respond to fluoxetine. Perhaps the primary reason why Prozac causes a favorable reaction in those who are treated (poisoned) with it, is that it disassociates that person from the psycho-spiritual conflicts that they must normally suppress in order to maintain the appearance of sanity and functionality in society, i.e. it is control and not health that is the goal of such "treatment." Eliminating exposure to fluoride is the #1 priority. We can start by being careful about surreptitious forms of fluoride in Teflon, foods and beverages produced with municipal water, tap water, infant formula, fluoride containing drugs like Prozac, toothpaste, etc. We have collected a number of studies from the US National Library of Medicine on natural substances which mitigate fluoride toxicity. We also have a section on our database dedicated to finding substances which prevent or reverse other forms of pathological calcification which may have relevance for pineal gland calcification, such as ectopic calcification. Lastly, there is research on the potential value of magnesium and phytate in reducing pineal gland calcification.